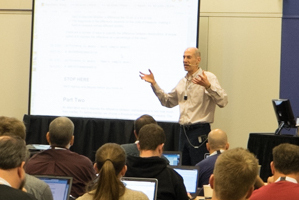 I was at PyCon 2015 last week, where I taught my tutorial on Bayesian statistics again. My slides and the video are here. I also taught a new tutorial on Statistical Inference. The slides and video are here. Other fun things I did: Python trivia night with Brandon Rhodes, a book signing where I met Charles Severance and caught up with Jeff Elkner, ran the PyCon 5K and finished 16th (pretty sure I won my age group, had dinner with Meg Blanchette and several fellow O’Reilly authors, lunch with current and former Olin students, the PyLadies charity auction, where I “won” a 26 pound gummi snake, attended many excellent talks, including a David Beazley’s live demo performance art, volunteered to chair a session, and had lots of great conversations with amazing Pythonistas. As always, thanks to all the organizers and volunteers. Looking forward to next year!